The Visual Designer caters for a number of drag-and-drop tools and report elements to be inserted into the report design, these include: Tables, Charts, Text and Parameters. 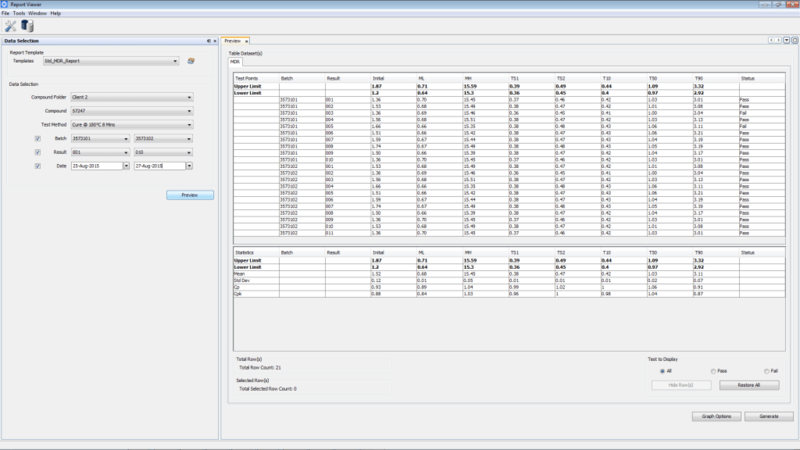 The Report Viewer is the acquisition element with advanced data filtering option, used to load specific Labline laboratory data into the report designs. 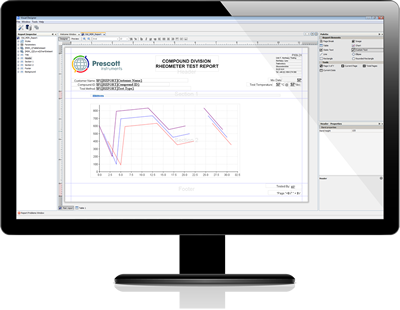 FlexiReports software for Labline complements the Prescott Instruments’ software range to give our clients ultimate flexibility to generate personalised and professional reports, in just a few easy steps. This sophisticated reporting system offers an attractive alternative to our standard Labline reports system (fixed template design), eliminating this constraint, to provide users with full control over Layout, Content and Design. 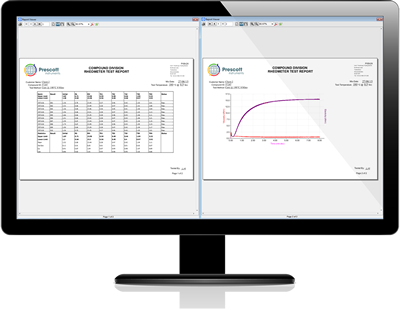 This comprehensive software package goes hand-in-hand with our Universal Instrument software, by supporting all custom configured laboratory instruments as well Labline configured instruments into one shared report system. This integrated application is developed for Microsoft Windows ® OS and configured to a universal ODBC centralised Labline database (Available for Microsoft SQL Server ® and IBM DB2 ®). Reports can be created from new (using blank templates) or from existing report designs, standard reports are also included. Organising the report layout is simple, as each report is separated into a number of sections; Title Page, Header, Footer, Background (for watermarks), Content Pages, all devised into sections of sub reports. Text and Custom Text (Parameters). Select and drag items into the report design. The more sophisticated elements will be prompted with a helpful step-by-step wizard dialogue. Any number of instrument models of the same compound can be presented in a singular report. Instruments include all Labline configured instruments and custom configured instruments. 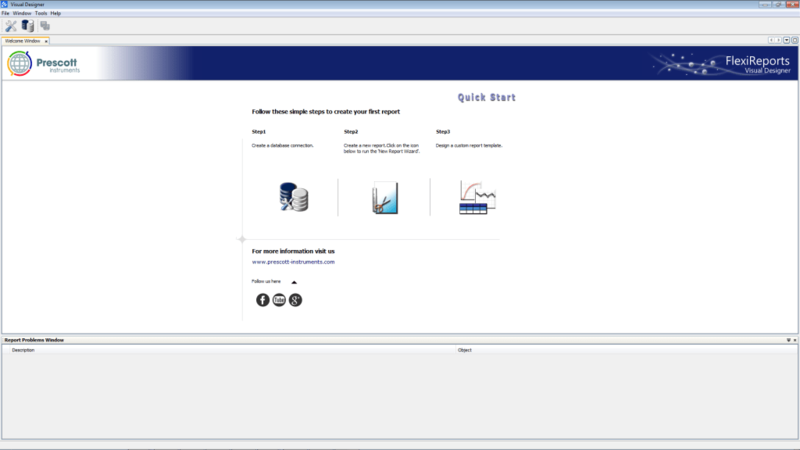 Once a report is created, it can be viewed in our query-based report publisher, equipped with three modes of test result filtration (standard, advanced and custom). Test results can be handpicked or excluded in a report. 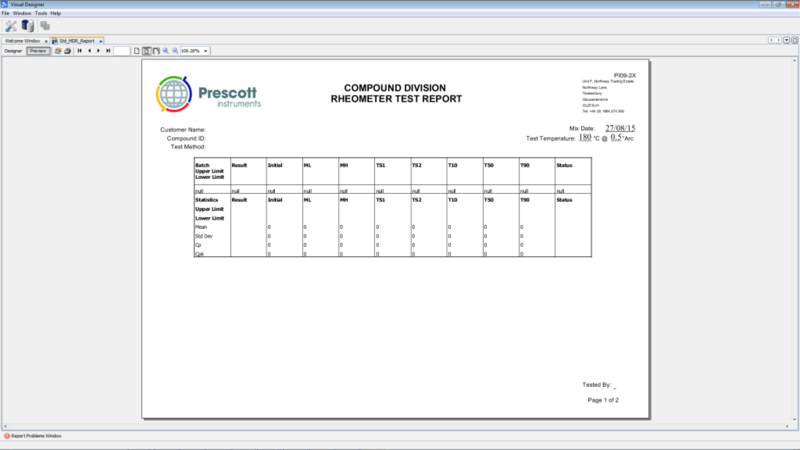 A generated report populated with test results can be printed and exported to PDF and Microsoft Excel ®. 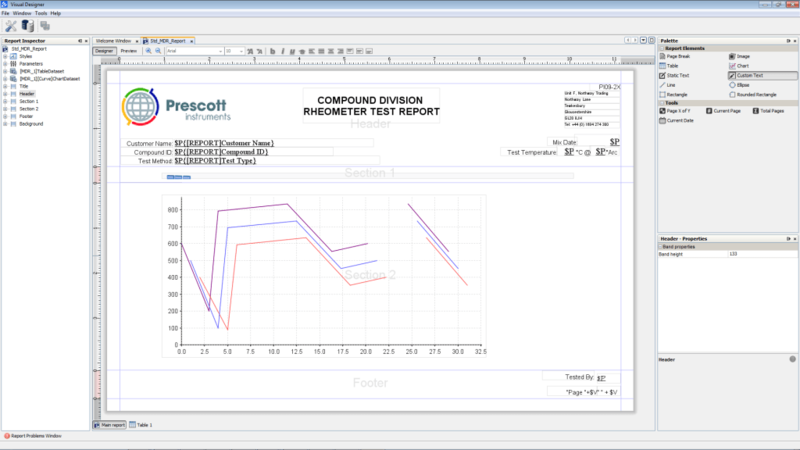 FlexiReports currently supports English and Russian. Reports can be stored locally or on the network as a physical file or configured to the database, allowing reports to be imported and exported accordingly. 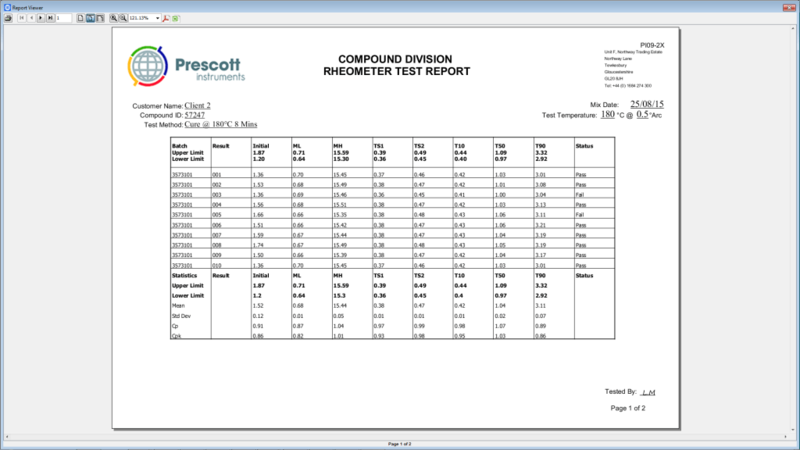 Save time by utilising our report re usability options; the created reports can be reused for multiple compounds and their test specifications, using our queried-based filtering. Custom text parameters can be added, to allow vital and specific information to be changed during each report print, thus having the same report for multiple clients. The chart component offers a choice of curve and trend charts, with options of: Displaying gates and limits via test point selection, axis scaling and styling. Curve charts can display any Labline channel, such as Torque and temperatures. Report tables allow for automatic pass/fail of test points, with the additional option to highlight the offended test points by formatting or highlighting. Table of test results can be organised and sorted into groups based a number of column elements such as: Date, Compound, Batch, Result and Pass/Fail. These can be in any order, with the preference of Ascending and Descending. This comprehensive software packages goes hand-in-hand with our Universal Instrument software, by supporting all custom configured laboratory instruments as well Labline configurable instruments into one shared report system. 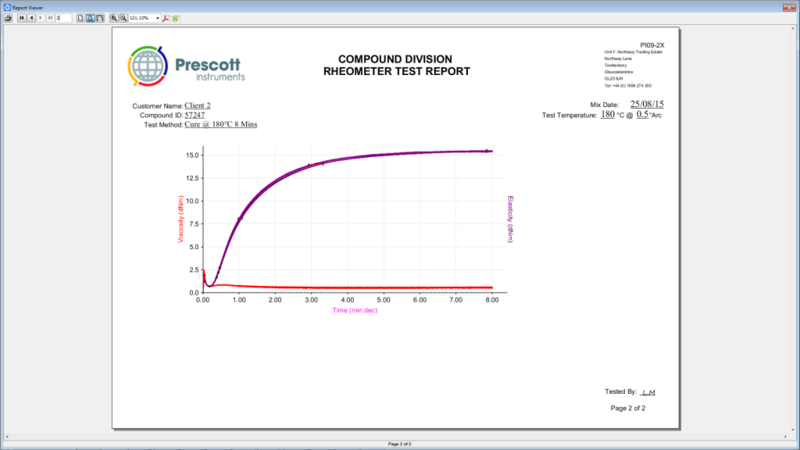 Our acquisition and analysis software for laboratory elastomeric testing equipment. Supports all manual-based rubber testing instruments and many more. 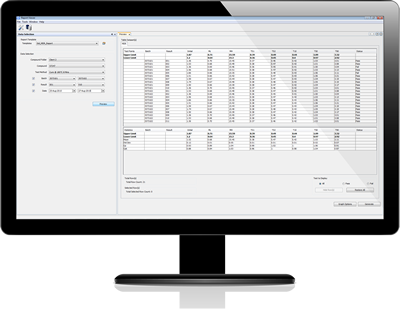 The FlexiReports software suite provides a pluggable universal ODBC database feature, that enables the option for further database expansion. Microsoft SQL Server ® or IBM DB2 ® Database; Database upgrade packages are available in order to provide a successful installation.